This articles is about the geologist; for his son see Henry Fairfield Osborn, Jr.
Henry Fairfield Osborn, Sr. ForMemRS (August 8, 1857 – November 6, 1935) was an American geologist, paleontologist, and eugenist, and the president of the American Museum of Natural History for 25 years. Son of the prominent railroad tycoon William Henry and Virginia Reed Osborn, Henry Fairfield Osborn was born in Fairfield, Connecticut, 1857. 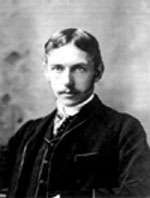 He studied at Princeton University (1873–1877), obtaining a B.A. in geology and archaeology, where he was mentored by paleontologist Edward Drinker Cope. Two years later, Osborn took a special course of study in anatomy in the College of Physicians and Surgeons and Bellevue Medical School of New York under Dr. William H. Welch, and subsequently studied embryology and comparative anatomy under Thomas Huxley as well as Francis Maitland Balfour at Cambridge University, England. In 1880, Osborn obtained a Sc.D. in paleontology from Princeton, becoming a Lecturer in Biology and Professor of Comparative Anatomy from the same university (1883–1890). In 1891, Osborn was hired by Columbia University as a professor of zoology; simultaneously, he accepted a position at the American Museum of Natural History, New York, where he served as the curator of a newly formed Department of Vertebrate Paleontology. As a curator, he assembled a remarkable team of fossil hunters and preparators, including William King Gregory; Roy Chapman Andrews, a possible inspiration for the creation of the fictional archeologist Indiana Jones; and Charles R. Knight, who made murals of dinosaurs in their habitats and sculptures of the living creatures. On November 23, 1897 he was elected member of the Boone and Crockett Club, a wildlife conservation organization founded by Theodore Roosevelt and George Bird Grinnell. Thanks to his considerable family wealth and personal connections, he succeeded Morris K. Jesup as the president of the museum's Board of Trustees in 1908, serving until 1933, during which time he accumulated one of the finest fossil collections in the world. Additionally, Osborn served as President of the New York Zoological Society from 1909 to 1925. Long a member of the US Geological Survey, Osborn became its senior vertebrate paleontologist in 1924. He led many fossil-hunting expeditions into the American Southwest, starting with his first to Colorado and Wyoming in 1877. Osborn conducted research on Tyrannosaurus brains by cutting open fossilized braincases with a diamond saw. (Modern researchers use computed tomography scans and 3D reconstruction software to visualize the interior of dinosaur endocrania without damaging valuable specimens.) He accumulated a number of prizes for his work in paleontology. In 1901, Osborn was elected a Fellow of the American Academy of Arts and Sciences. He described and named Ornitholestes in 1903, Tyrannosaurus rex in 1905, Pentaceratops in 1923, and Velociraptor in 1924. In 1929 Osborn was awarded the Daniel Giraud Elliot Medal from the National Academy of Sciences. Despite his considerable scientific stature during the 1900s and 1910s, Osborn's scientific achievements have not held up well, for they were undermined by ongoing efforts to bend scientific findings to fit his own racist and eugenist viewpoints. His legacy at the American Museum has proved more enduring. Biographer Ronald Rainger has described Osborn as "a first-rate science administrator and a third-rate scientist." Indeed, Osborn's greatest contributions to science ultimately lay in his efforts to popularize it through visual means. At his urging, staff members at the American Museum of Natural History invested new energy in display, and the museum became one of the pre-eminent sites for exhibition in the early twentieth century as a result. The murals, habitat dioramas, and dinosaur mounts executed during his tenure at the museum attracted millions of visitors, and inspired other museums to imitate his innovations. But his decision to invest heavily in exhibition also alienated certain members of the scientific community and angered curators hoping to spend more time on their own research. Additionally, his efforts to imbue the museum’s exhibits and educational programs with his own racist and eugenist beliefs disturbed many of his contemporaries and have marred his legacy. An African dwarf crocodile, Osteolaemus osborni, was named in his honor by Karl Patterson Schmidt in 1919. "We have all borne with the ape and monkey and ape hypothesis long enough are we are glad to welcome this new idea of the aristocracy of man back to a even remote period than the beginning of the stone age." While believing in common ancestry between man and ape, Osborn denied that this ancestor was ape-like. The common ancestor between man and ape Osborn always maintained was more Human than ape. Writing to Arthur Keith in 1927, he remarked "when our Oligocene ancestor is found it will not be an ape, but it will be surprisingly pro-human". His student William K. Gregory called Osborn's idiosyncratic view on man's origins as a form of "Parallel Evolution" but many creationists misinterpreted Osborn, greatly frustrating him, and believed he was asserting man had never evolved from a lower life form. Osborn was originally a supporter of Edward Drinker Cope's neo-Lamarckism, however, he later abandoned this view. 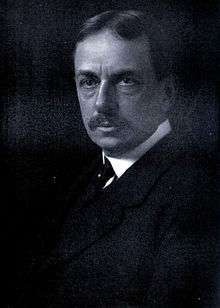 Osborn became a proponent of organic selection, also known as the Baldwin effect. Osborn was a believer in orthogenesis, he coined the term aristogenesis for his theory. His aristogenesis was based on a "physicochemical approach" to evolution. He believed that aristogenes operate as biomechanisms in the geneplasm of the organism. He also held the view that mutations and natural selection play no creative role in evolution and that aristogenesis was the origin of new novelty. ↑ Woodward, A. S. (1936). "Henry Fairfield Osborn. 1857-1935". Obituary Notices of Fellows of the Royal Society. 2 (5): 66. doi:10.1098/rsbm.1936.0006. ↑ "After Twenty Years:The Record of the Class of 1877", Princeton University, 1877–1897, p. 72. Trenton, N. J. 189. ↑ "Henry Fairfield Osborn (1857–1935)", Hervey W. Shimer, Proceedings of the American Academy of Arts and Sciences, Vol. 72, No. 10, May, 1938, pp. 377–379. ↑ "Archives of the Boone and Crockett Club". ↑ "Introduction," in Larsson (2001). Pg. 20. ↑ "Abstract," in Larsson (2001). Pg. 19. ↑ "Book of Members, 1780-2010: Chapter O" (PDF). American Academy of Arts and Sciences. Retrieved 14 April 2011. ↑ "Daniel Giraud Elliot Medal". National Academy of Sciences. Retrieved 16 February 2011. ↑ See Ronald Rainger, An Agenda for Antiquity: Henry Fairfield Osborn and Vertebrate Paleontology at the American Museum of Natural History, 1890–1935 (Tuscaloose, AB: University of Alabama, 1991). ↑ On the American Museum's habitat dioramas, see http://www.amnh.org/exhibitions/dioramas/; Karen Wonders. Habitat Dioramas, (Figura Nova Series 25: Acta Universitatis Uppsaliensis, 1993). ↑ Victoria Cain, "The Art of Authority: Exhibits, Exhibit Makers and the Contest for Scientific Status at the American Museum of Natural History, 1920–1940." Science in Context 24, no. 2 (2011). ↑ Donna Haraway, "Teddy Bear Patriarchy," Primate Visions: Gender, Race and Nature in the World of Modern Science. (New York: Routledge, 1989). Also see Constance Clark, God – or Gorilla: Images of Evolution in the Jazz Age. (Baltimore, MD: Johns Hopkins University Press, 2008) and Victoria Cain, "The Direct Medium of the Vision": Visual Education, Virtual Witnessing and the Prehistoric Past at the American Museum of Natural History, 1890–1923." Journal of Visual Culture vol. 10, no. 3 (2010). ↑ Beolens, Bo; Watkins, Michael; Grayson, Michael (2011). The Eponym Dictionary of Reptiles. Baltimore: Johns Hopkins University Press. xiii + 296 pp. ISBN 978-1-4214-0135-5. ("Osborn", p. 196). ↑ "Recent Discoveries Relating to the Origin and Antiquity of Man", Henry Fairfield Osborn, Science, New Series, Vol. 65, No. 1690, May 20, 1927, pp. 481–488. ↑ "Man was Never an Ape", Popular Science, 1927, Aug 1927, Vol. 111, No. 2, p. 35. ↑ "The Hunt for the Dawn Monkey: Unearthing the Origins of Monkeys, Apes, and Humans", Christopher Beard, University of California Press, 2006. ↑ "Human evolution: an illustrated introduction", Roger Lewin, Wiley-Blackwell, 2005, p. 15. ↑ Bones of contention, Roger Lewin, University of Chicago Press, 1997, pp. 56-57. ↑ Lewin, 1997, p. 56. ↑ Lewin, 1997, p. 57. 1 2 Levit, Georgy S; Olsson, Lennart. (2007). Evolution on Rails Mechanisms and Levels of Orthogenesis. In Volker Wissemann. Annals of the History and Philosophy of Biology 11/2006. Universitätsverlag Göttingen. pp. 107-108. Larsson, H.C.E., 2001. Endocranial Anatomy of Carcharodontosaurus saharicus. In D.H. Tanke & K. Carpenter (eds. ), Mesozoic Vertebrate Life: pp. 19–33. Rainger, Ronald (2004). An Agenda for Antiquity: Henry Fairfield Osborn and Vertebrate Paleontology at the American Museum of Natural History, 1890-1935. University of Alabama Press. ISBN 0817350799. Regal, Brian (2002). Henry Fairfield Osborn: Race, and the Search for the Origins of Man. Ashgate. ISBN 978-0-7546-0587-4. Robertson, Thomas, “Total War and the Total Environment: Fairfield Osborn, William Vogt, and the Birth of Global Ecology,” Environmental History, 17 (April 2012), 336–64.